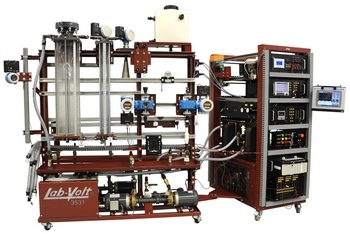 The Lab-Volt Instrumentation and Process Control Training System introduces students to a wide range of industrial processes (temperature, pressure, flow, and level) as well as with their instruments and control. The use of modern equipment coupled with a complete training program helps students to get the theoretical and practical knowledge that is mandatory to work in the process control industry. The Process Workstation is the hub of the different processes to be investigated by the students. It consists of a double-sided mobile workstation equipped with two 60-liter (16-gal) tanks, up to four centrifugal pumps, a Rotameter, a Drip Tray (Front), an Instrumentation Mounting Pipe, Ball Valves, and Process Supports. Up to two groups of students can work at the same time on Pressure/Flow/Level experiments, one group on each side of the Process Workstation. This can be done if the Pressure/Flow/Level option is selected and if the Second Team Add-On, Model 3530-H or -K (HART) is ordered (3530-J or - L for Fieldbus). The Instrumentation Workstation is designed to house the Electrical Unit and the Pneumatic Unit as well as other electrical equipment such as the variable speed drives. Devices such as controllers, PLCs, Color Paperless Recorder, and Touch Screen Graphic Terminals must be installed on the Instrumentation Workstation. The workstation aims to recreate the widespread industrial practice of separating the process environment from the instruments and controllers and it limits the risk of exposing such equipment to contact with water.